SYNOPSIS: Singer. Rebel. Outlaw. Hero. With his driving freight-train chords, steel-eyed intensity and a voice as dark as the night, the legendary “Man in Black” revolutionized music—and forged his legacy as a genuine American icon. 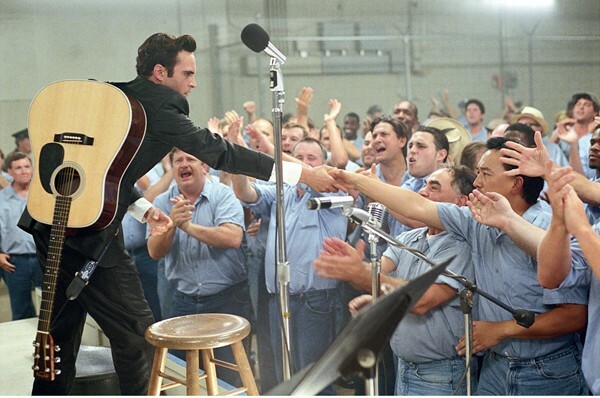 Golden Globe® nominees Joaquin Phoenix and Reese Witherspoon star (and sing) as Johnny Cash and June Carter in this inspiring true story of one man’s unwavering devotion to his sound, his message and the greatest love of his life. DVD OVERVIEW: The music of the legendary “Man in Black,” Johnny Cash, continues to rock when Walk the Line Extended Cut arrives on two-disc DVD March 25th from Fox Home Entertainment. Featuring over 17 minutes of footage, Walk the Line Extended Cut includes director commentary as well as a bonus disc packed with Grammy® award-winning performances, deleted scenes, and more. The multi-award winning film from director James Mangold (3:10 to Yuma, Girl, Interrupted), stars Joaquin Phoenix and Reese Witherspoon (Election, Vanity Fair), as the rebellious musician and his lifelong-love and savior June Carter. “Brilliant. Masterful,” (The Wall Street Journal), Walk The Line garnered multiple awards including Reese Witherspoon’s Oscar® for Best Performance by an Actress, and three Golden Globes® including Best Motion Picture, Musical or Comedy, as well as Best Performance by an Actor and Actress. BONUS FEATURES: The DVD is loaded with extra features the new features for this edition are Becoming Cash / Becoming Carter featurette, Sun Records & The Johnny Cash Sound featurette and The Cash Legacy featurette. These featurettes are more inside to the movie and to what is Johnny's legacy to country music.